One of the best parts of exploring the Northwest, is checking out new areas that are close to home. Last summer I was reading a local magazine, and saw Point Ruston. It's the trendiest up and coming neighborhood in Tacoma. I didn't waste any time making a visit. When I went, the community was just in the beginning stages. Since then, a lot of construction has taken place.The area is booming with new eateries, shops and condos. It is just so beautiful. Point Ruston is in North Tacoma, and located down on the waterfront. It is my new and favorite GO TO spot. I absolutely love it! I've lived in the Seattle area for 30 years, and have taken in many views of Rainier from around the area. In my opinion, this is the best place to capture a panoramic view. Of course : we all know it rains cats and dogs in the Northwest, so your window of opportunity to get a clear view is limited. This month is still a great time to catch it. The choices to dine are many, and you can eat anything you are craving at Point Ruston. Most of the restaurants offer a scenic water view. WildFin has stole my heart and taste buds! It was the first eatery I tried. It has some of the best seafood I've ever tasted. The crispy melt in your mouth cod and homestyle fries are delicious. This seafood will have you licking your lips for hours! There is so much to love about Wildfin. You can dine inside, outside on the deck with Mt. Rainier or at the bar. That's not all! If you are on a time crunch, there is a walk up counter on the backside of the restaurant. You can take it home, or eat at the stand up tables in the courtyard. The kids meal is huge and a real deal at $5.69: it comes with two pieces of fish and a boat load of fries. Wheel Fun Rentals offers rides on cycles you won't soon forget. Everyone in the family, young and old, can whiz around the sound! There are a variety of fun equipment for rent. We chose to rent a Surrey bike, which was as total blast! If you are an outdoor enthusiast or just there for sight seeing: a cruiser is available to rent to meet your needs. Choose from the fleet of tandem bikes, specialty cycles, quad sports and kid's bikes. If you are a low rider there is a chopper waiting just for you. The water fountain is a big hit for the littlest members of the family, and perhaps the big kids too . It was so hot this day, I wanted to jump in myself! The Jewel box is a destination coffee shop, with a vintage ambiance. It's the perfect place to meet up with your family or new friend. The large variety of sandwiches, baked goods and espresso drinks all made me hungry. I had a hard time choosing. If you are a fan of bubble tea, the selection of flavors are endless. My cup of coffee was good to the last drop: lipstick on the cup means it was good! The business of life sometimes makes it hard to take time away and unplug. Every time I come here, I feel an atmosphere of total calm and relaxation. By the time you leave, you will feel recharged and upbeat. I always can't wait to come back again. Point Ruston is a happy, feel -good kind of place. Your furry friends will love to take a walk here too! Over the past few months several new apartment and condo residences have been constructed. I heard they are filling up fast. I would love to live here, it is definitely a haven by the sea. I haven't checked into all the details of what's available. From what I've heard, some units can purchased and others are for rent. A tanning salon, style boutiques and an ice cream shop are now open. A hotel is in the works, and a public market is open during the summer. Check the Point Ruston site for dates and times. Have you visited Point Ruston yet? I do hope you can make a visit soon. Enjoy the last few weeks of summer and travel safe. I'm always sad to see my favorite season go. If you enjoyed this post, feel free to leave a comment or share on social media. How fun! I've never been here before, but really hope to soon. It is my favorite spot in the Seattle area now..IN LOVE! Ha Hope you go soon! Seafood, great coffee and beautiful views!! I'm heading straight here when I'm in Seattle next! I'm always so excited to find new places to visit and explore around the Seattle area. Hey Ellie, yes its so amazing there, you will love it! Hi Terumi, it was a blast! I cant wait til its all finished! How cute! I had no idea this existed. Will definitely have to check it out with the family! Thanks for stopping by Keziah! Hope you can soon! YEs lots to do in Tacoma, I am exploring there more and more! Thanks for stopping by! Thank you Carmen, have a great weekend, yes the Jewel Box is Amazing! I haven't visited Tacoma, but your post persuaded me to want to visit! Wild Fin looks like a great spot to eat. Tacoma has lots of beautiful scenery, it often gets left out of the NW must sees....especially this spot..its amazing! 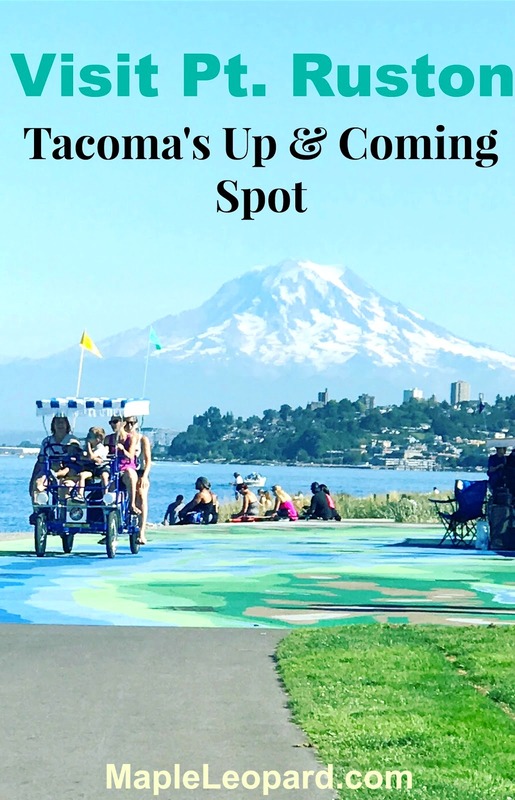 YEs Tacoma has not been the most desired place in the past but this is changing thanks to great neighborhoods coming up like this.I LOVE IT THERE! I can imagine that the seafood here is amazing. Living in Dallas, we don't always have the freshest seafood. LOL. The views of Mt. Rainier were spectacular also. I will definitely by adding to my bucket list after this post! Thanks for sharing. Seattle is one of my favorite cities in the world but I've never actually hung out in Tacoma. Good to know that it has some spots worth visiting as well! 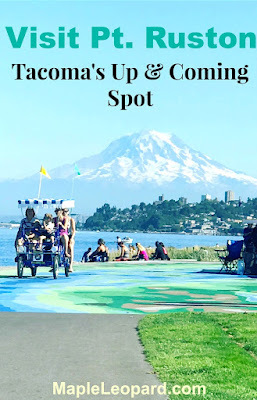 Yes Tacoma used to be more dumpy and not very exciting but its really doing a turn around..I LOVE this spot..so amazing! Those paradise views caught my attention right away! I would LOVE to take my mom here one day. She would adore those vintage coffee shops, and just spending time outdoors with such beautiful scenery! Yes right..to die for views ..everything there is a total delight..like in a dreamworld..ha! I love seafood! That cod and homestyle fries sounds so yummy! I would definitely dine outside and enjoy the view of Mt. Rainier. I do too Candy! The view is so so amazing, hope you make it there ! Thank you Rebecca...yes a very cool spot! I hadn't even heard of this place before reading this. What an amazing background with that towering mountain! Wow this is such a wonderful place honestly which I haven't heard about. Love your pictures and I'm actually getting a vibe of Europe in Point Ruston. Might include when I visit Seattle some day!! My love for seafood would definitely bring me here. Thanks for sharing. It seems like such a beautiful place. Awesome article! I want people to know just how good this information is in your article. It’s interesting, compelling content. Your views are much like my own concerning this subject about wild life, Mark Hutchinson is perfect option, if you wanna more about this. Hey there, I'm Valerie. I live near Seattle, & Vancouver B.C. is my home. Here you will find travel guides for: cities,the beach, cruises and mountain stops. Also included- destination style for the trip. I hope to inspire women 35+ to experience the best of life: by trying new places and styles. Sign up to receive exciting travel and style stories right to your inbox! and style stories right to your inbox!